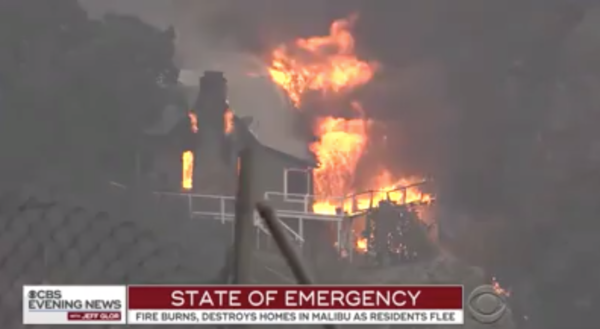 The Woolsey wildfire in Southern California, which has destroyed more than 150 homes, affected thousands more homes and killed five people, spread to Malibu Friday afternoon. Officials warned residents to evacuate immediately as the uncontained flames reached the area and destroyed dozens of hillside properties. The fire has taken out more than 7,000 over three days, making it the 3rd largest such fire in California history and one of the most widespread in a heavily populated region in American history. Fueled by dry weather and strong winds, the nearby Hill fire has burned about 6,000 acres, prompting Acting Gov. Gavin Newsom to declare a state of emergency for Los Angeles, Butte, and Ventura Counties in the stead of Governor Jerry Brown, who was traveling out-of-state. After spreading to Malibu Friday, the Woolsey fire has covered more than 10,000 acres and resulted in more than 90,000 mandatory evacuations. Other affected areas include the Oak Park, Thousand Oaks, Bell Canyon, and Ventura County neighborhoods. Many of the celebrities and public figures who call Malibu home were among those affected by the fire on Friday. Caitlyn Jenner, who joined thousands of residents who were forced to evacuate—including her step-daughter Kim Kardashian West—lost her home to the fire, according to reports from TMZ. That evening Jenner and her wife posted that while they were safe with their dogs, they did not know whether the home had been destroyed or spared. Hours later, TMZ retracted their earlier story and reported Jenner’s property was not structurally damaged. The City of West Hollywood has urged community members to stay informed about the fires and review emergency preparedness tips even though the area is not under immediate threat.